TomTom GO 910 personal portable GPS system features 4 inch LCD touch screen – a world’s first in portable navigation, 20 GB hard disk with fully integrated MP3 player for playing audiobooks, music and podcasts as well as text-to-speech functionality, multi-continental map coverage including the whole of Europe, the USA and Canada, HOME dock – enabling users to connect to TomTom HOME through their computer, and full extensive iPod integration. Laptop Magazine reviewed TomTom GO 910 and concluded that despite the outdated POI data we encountered and the high price, the TomTom GO 910’s remarkable ease of use and plethora of useful and fun features help it blow away the competition. 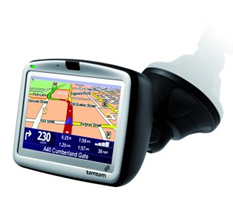 Check out more TomTom Go 910 reviews.